High quality 1 1/2" deep (tall) slip-on soft white vinyl PVC end caps for 1 1/4" round tube. These Vinyl End Caps are designed to fit round tubular steel wood or plastic pipes and posts. These pliable Vinyl End Caps can stretch up to 1/8" larger for a snug fit without tearing, splitting, or shredding. Made in the USA from soft PVC "rubber like" that will hold up for years of use. All caps are 1" deep / tall **DIMENSIONS ARE FOR OUTSIDE OF THE POST/TUBING** (Select the size that matches your pipe, post, or tubing outside measurement) MADE IN THE USA!!!! Fits 1 1/4" OD round tube or pipe (*OUTSIDE diameter) & can stretch up to 1/16" larger for a snug fit without tearing or splitting. 1" tall / deep to provide a secure fit. This set of 8 (eight) high-grade Prescott Plastics white soft PVC "rubber like" caps are made in the USA. Our caps are designed to hold up against impact abuse, and harsh weather conditions to provide years of protection. 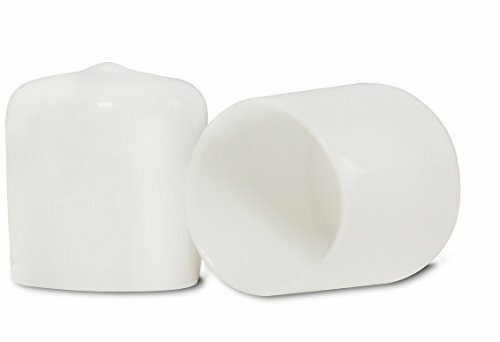 Our flexable end caps work great for preventing scuffs on kitchen or wood floor, as pliable protective seal for metal chair tips, patio furniture, bench feet, table legs, bar stools, or to cover any round pole or hole. These easy to install 1.25 inch push-on caps serve as a long-lasting solution for many household, outdoor, & marine boat dock projects including replacements for fencing railing posts, steel gate rail stopper, rod / rebar or wrought iron caps, thread bolt screw or nut safety, hub cap sheath, or finishing any round tubing. If you have any questions about this product by PVB413, contact us by completing and submitting the form below. If you are looking for a specif part number, please include it with your message.